Arsenal's Alex Oxlade-Chamberlain has turned down a move to Chelsea after the Premier League clubs agreed a £40m fee. The 24-year-old England international wants to move to Liverpool and the Anfield club are interested in a deal. A bid is expected before Thursday's transfer deadline, although it will be short of the £40m Chelsea offered. Should a move not transpire, Oxlade-Chamberlain will see out the final year of his contract before potentially leaving on a free transfer next summer. Arsenal want any deal for the former Southampton midfielder completed as quickly as possible. Oxlade-Chamberlain has started every game for the Gunners so far this season, including Sunday's 4-0 defeat at Liverpool, when he was substituted. Transfer deadline countdown: Who could move and who needs what? Chelsea manager Antonio Conte had made it clear he wanted to add further to his squad before the transfer window closes on Thursday. 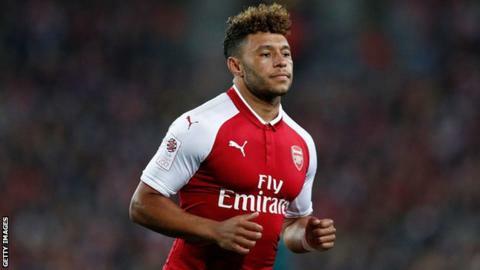 Oxlade-Chamberlain has made 198 appearances for Arsenal since joining them from Southampton in August 2011.
Who could move and who needs what? Read more on Transfer deadline: Who could move - and what do Premier League clubs need?